Angular trim flat liner brushes. Select quality stiff, yet fine white bristle set in seamless nickel plated ferrule, roll crimped to a plain sanded long style hardwood artist handle. Suitable as a detail brush or liner, stiff enough for oil painting. 05913 1/4" 1/2" 11 1/4"
05914 1/2" 3/4" 11 1/4"
05916 1" 1 3/8" 12 1/2"
Angular Trim Fitch Liner Brush Assortment. 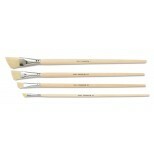 A (4) brush assortment of long handled white bristle angular trim brushes, set in seamless nickel plated ferrules consisting of (1) each of widths 1/4, 1/2, 3/4 & 1", shipped in a clear protective sleeve.